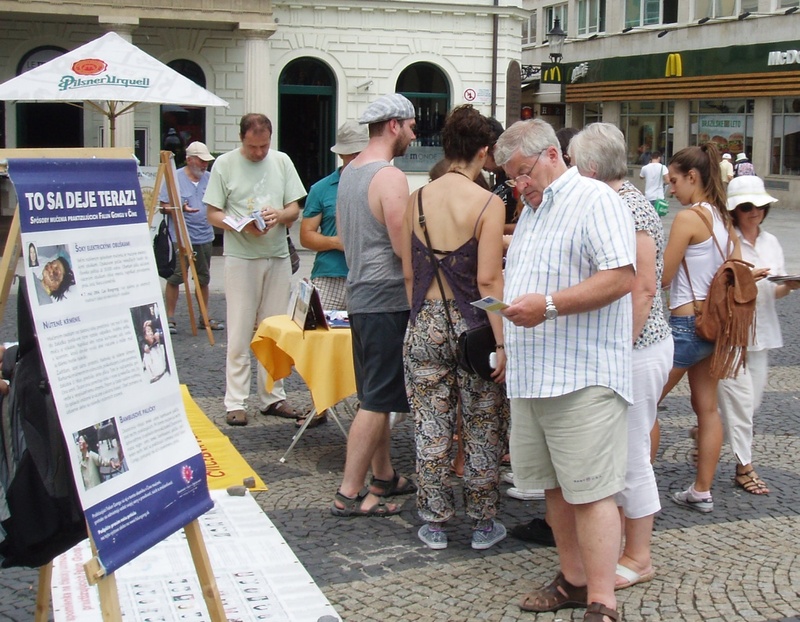 From July 21 to 26, Falun Gong practitioners in Slovakia held a tour through six cities to raise awareness of the persecution in China and to collect signatures against the Chinese Communist Party's (CCP) forced organ harvesting of persecuted Falun Gong practitioners. The tour took off from Bratislava, the nation's capital. 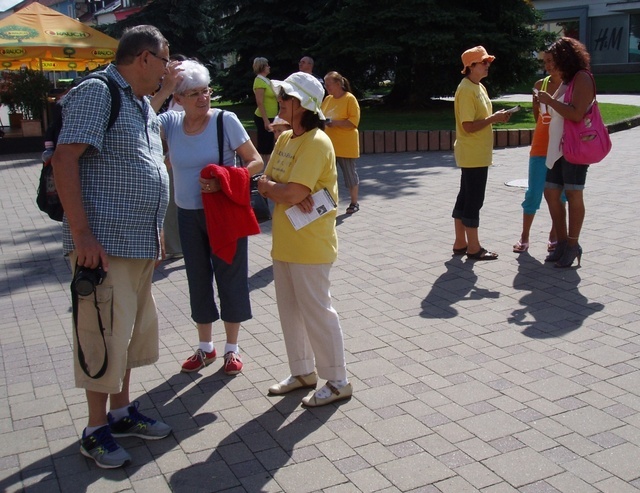 On Hviezdoslav Square, many Chinese tourists stopped by the practitioners' booth and took informational materials about Falun Gong. On the July 22, practitioners arrived in Zilina, a town in the northwest. The local media came out for an interview, and several local residents learned the Falun Gong exercises. In Ruzomberok and Presov, two towns in the middle of the country, practitioners demonstrated the exercises. Many people told practitioners that they still have memories of the communist party's tyranny. They signed the petition, expressing their support for practitioners' peaceful resistance to the persecution. In Kosice, the second largest city in Slovakia, there were long lines of people in front of the practitioners' booth, waiting to sign the petition. Some said to the practitioners, “We remember you. We saw you doing the exercises in the park.” Several people told them that they had already signed a petition in support of Falun Gong. The tour ended in Poprad, a small town in northeastern Slovakia. A local newspaper publicized the event in advance. When the practitioners got there, a gentleman was waiting for them, hoping to learn as much as he could about the persecution. During the half-day event, many local residents and tourists signed the petition. After signing, an elderly couple said to the practitioners, “We appreciate very much that you are helping others. We appreciate all people, who do it."